As the Planck-Einstein relation, it says that the energy of a photon is a multiple of the quantum of energy. Let’s start with the first interpretation. You’ll usually hear the Planck-Einstein relation is about the energy of a photon being proportional to its frequency (E = h·f), with h the proportionality constant. So why do I say something different here? The energy of a photon is a multiple of the quantum of energy? What does that mean? Indeed, you’ve surely heard about the quantum of action: that’s h—Planck’s constant. But what’s the quantum of energy? Can we also equate that to h? Perhaps. Let’s look at it. The dimension of Planck’s constant is the dimension of physical action: h ≈ 6.62607×10−34 joule–second (J·s). The action and energy concepts are different and, therefore, the quantum of action and the quantum of energy – whatever it is – should also be different, right? Is frequency a continuous variable? In my humble opinion, it isn’t. It’s a bit of a definitional issue. Frequency is measured per second: frequency is the number of cycles per second. That number is a count variable. So let’s think about our unit of time. How do we define time? Time is obviously a continuous variable, isn’t it? Well… Maybe. But maybe not. Time itself is defined with regard to some frequency, so it refers to a count datat type. For eample, the concept of a day refers to one rotation of the Earth, and nowadays we measure time referring to the frequency of radiation. Let me be precise here: the second was defined as the duration of 9 192 631 770 periods of the radiation corresponding to the transition between the two hyperfine levels of the ground state of the caesium–133 atom. Look at the definition: we don’t say about 9 192 631 770 periods. No. It’s 9 192 631 770 cycles exactly. So… Well… I think frequency is a count variable. I’ll go even further: I actually like to think of time as a count variable too. Huh? I must be joking, right? What would be the unit? Well… I am not saying time is a count variable: I am saying it’s nice to think of time like that. To do so, we must imagine some kind of fundamental cycle. How? If we’d take sodium light, whose frequency is – roughly – 5.1×1014 Hz, then we find that one cycle corresponds to an energy that’s equal to 3.38×10−21 J. 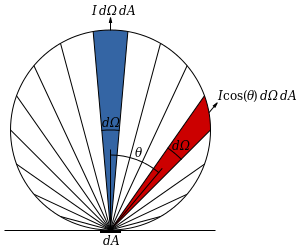 So we cannot use radiation to define some kind of fundamental cycle whose energy would correspond to h. Having said that, what we can do, on the other hand, is look at that fundamental difference between energy levels which explains, for example, blackbody radiation (En = n·ħ·ω) or, what amounts to the same, the difference in energy between an electron whose spin is ‘up’ (Jz = +ħ/2) as opposed to an electron whose spin is ‘down’ (Jz = −ħ/2). In other words, we can think of an oscillation between those two energy levels, and that – in my humble opinion – does correspond to a fundamental oscillation whose cycle corresponds to the energy quantum, i.e. ħ (rather than h). And remember that graph for the probabilities to be in state 1 or state 2? I copied it below. As A = ħ, we’d measure time now in units of… Well… What? Well… ħ/A = ħ/ħ = 1 here, so we’d just measure time in… Well… Its normal unit: seconds. Does that make sense? First, the C1(t) and C2(t) functions are not independent. Of course. They never are. But this shows it in a very powerful way. They’re related through Euler’s function which, as I’ll show in a moment, represents the normalization condition (the probabilities, taken over all possible states, have to add up to one). What can we do with this? 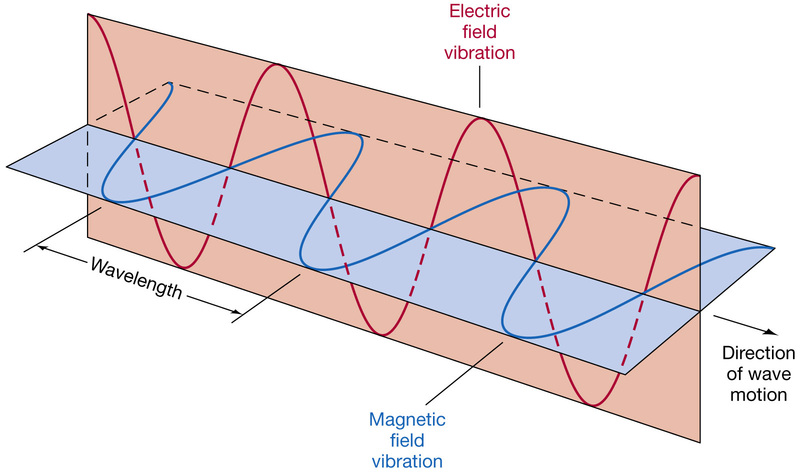 Could we relate it, for example, with the E and B vectors of electromagnetic radiation, whose direction − but not their phase! − also differs by an angle equal to π/2, as illustrated below? Perhaps, but we’re talking something else: we’re talking the quantum-mechanical description of a quantum-mechanical system—i.e. we’re describing reality! 🙂 So let’s not bother about how we’d describe radiation. The point is: we’ve got a mathematical model of reality here that makes sense, and one which respects Occam’s Razor. Of course, now you’ll grumble. OK, we have a model of an electron in free space whose spin oscillates between ‘up’ and ‘down’ here, and each cycle corresponds to an energy level equal to ħ. So it should emit some radiation. You’re right. Think about it. To be frank, I am not quite sure what to make of all this. Would free electrons really be emitting radiation like that—every time they make a transition? Electrons orbiting around the nucleus don’t emit radiation but… Well… They’re not supposed to change their spin every π seconds or so—which is what our model is saying here. Indeed, the model is really the same as that for the ammonia molecule, for which A ≈ 0.5×10−4 eV. That’s tiny, but the A/ħ ratio in those probability functions – I copied them once more (see below) – is still huge: (0.5×10−4)/(6.582×10−16) ≈ 76×109. So that’s 76 billion. To be clear on this, if we say that we’re measuring time in units of ħ/A – which is what we do in that graph above – then we’re measuring time in billionths of a second. Note that we do that because A is like a billion times ħ! You may also remember we calculated the period of the spontaneous transition frequency as t = ħ·π/A ≈ 41.3 ×10−12 s, so we’re talking pico-seconds here. Finally, you may or may not remember we also talked about the natural oscillations inside of an uranium nucleus, whose frequency was of the order of 1022 per second. In short, the period of that electron oscillation model that we’ve got here is huge. So the natural question is: does it make any sense? I think its logic is sound, but… Well… I’ll admit it all looks very funny. If anything, it makes one think through all of the stuff we’ve been discussing, doesn’t it? What we’ve got here is a limit situation, which tests our concepts. As I told you already: Euler’s function here just states the normalization condition and, by doing so, we can look at it as representing the whole system. To put it differently: in this generic model, we have Euler’s function describing the state of an elementary particle (i.e. any spin-1/2 particle really) in time. OK. So far so good. Let me present all of the above from another another angle now. Let’s come back to that zero energy assumption. E0 is the sum of the rest energy, the kinetic energy, and the potential energy. We can always choose the zero point for measuring potential energy such that E0 is zero, but I admit that’s very artificial. Moreover, in free space we assume there is no potential energy. Hence, when describing some real particle, we should not assume that E0 is zero. How does E0 ≠ 0 change the analysis above? Let’s look at those C1(t) and C1(t) formulas once more, but let’s simplify them by assuming we measure energy in units of ħ, so we write E0/ħ, A/ħ and ħ/ħ just as E0, A and 1. This is another delightful formula: it shows how the non-zero energy splits our cosine and sine functions into a real and imaginary part. It’s quite interesting to play with the various sine and cosine combinations, i.e. the real and imaginary parts of those wavefunctions above. For example, the cos(E0t)·cos(t) function, over one cycle (so I let t range from −π to +π), looks as follows for E0 = 0, 10 and 100 respectively. As you can see, higher energy levels are associated with a higher ‘density’ in time. You can play yourself with an online graphing tool. The question is: what does it all mean? The answer is: Occam’s Razor. When we’re going to describe the interaction between two particles, we’ll have four possible situations: both particles have their spin in the same direction (‘up’ or ‘down’), or or one is ‘up’ while the other is ‘down’. The ‘degrees of freedom’ in the quantum-mechanical wavefunction model are just right: we don’t need any more or less. It’s all just right. Think about modeling uncertainty in classical versus quantum mechanics. I. In classical mechanics, the angular momentum vector of an object can point in any direction: all angles θ are equally likely. Hence, θ, as a function of time (θ = ω·t), follows a continuous and uniform probability distribution. We write: P(θ) = 1/(2π), and the normalization condition is self-evident: ∫P(θ)dθ = 2π/(2π) − 0/(2π) = 1 − 0 = 1. The probability of being in state 1 or state 2 is now equal to cos2(ωt) and sin2(ωt) respectively. The normalization condition is equally self-evident, but different: cos2(ωt) + sin2(ωt) = 1. If we look at it like this, it’s equally self-evident that the natural unit to measure time is π or 2π, because that’s periodicity of our wavefunction and probability function. The independent variables (i.e. the xi above) are time (t) and position (x). The statistics which I am referring in my post here are known as circular statistics. They involve a so-called wrapped probability distribution. The term is clear enough: if t is just a real number between –π and +π, and its distribution is uniform, i.e. P(t) = 1/2π, then what’s the distribution of P[cos(t)], or of P[sin(t)]? Circular statistics involves problems such as the one that’s illustrated below: if a light source emits photons in all directions in a continuous stream that we denote as I, then what’s the number of photons/sec directed into any wedge. The answer is: it’s going to be proportional to the area of the wedge. But so we’ve got another problem here. It’s illustrated below: y(x) is, obviously, equal to cos(x). As you can see, as the angular velocity is some constant, and because of the geometry of the situation, the values near ±1 are more likely than the values near 0. So what’s the probability distribution here? You may think it’s the cosine function itself but… No. Probabilities are always values between 0 and 1, not between −1 and +1. Of course, the square of the cos(x) function would be a candidate function. But… Well… Is it the probability density function we’re looking for here? In light of what I wrote above, you’ll be surprised to hear that the answer is: no! For starters, the cycle of cos2(x) is π, not 2π (as shown below). We need a distribution over a [0, 2π] interval. It can be re-written as follows, and I also included its graph below.